ISRAEL: Prime Minister Benjamin Netanyahu was on the path to victory in Israel’s elections on Wednesday after nearly complete results put him in position to form a right-wing coalition and further extend his long tenure in office. Netanyahu spoke in the early hours of Wednesday at the Likud’s post-election party in Tel Aviv and called it a “magnificent victory.” As he walked onto the stage to chanting crowds, he planted a kiss on the lips of his wife Sara. Earlier while addressing cheering supporters who waived Israeli flags at an event hall in Tel Aviv, Gantz called it a “historic day.” “The president must give us the task of forming the next government since we are the biggest party,” he said after initial exit polls. The election was in many ways a referendum on the Premier who has built a reputation as guarantor of the country’s security and economic growth, but whose populism and alleged corruption left many ready for change. Netanyahu sought to portray himself as Israel’s essential statesman in the run-up to the vote and highlighted his bond with US President Donald Trump. 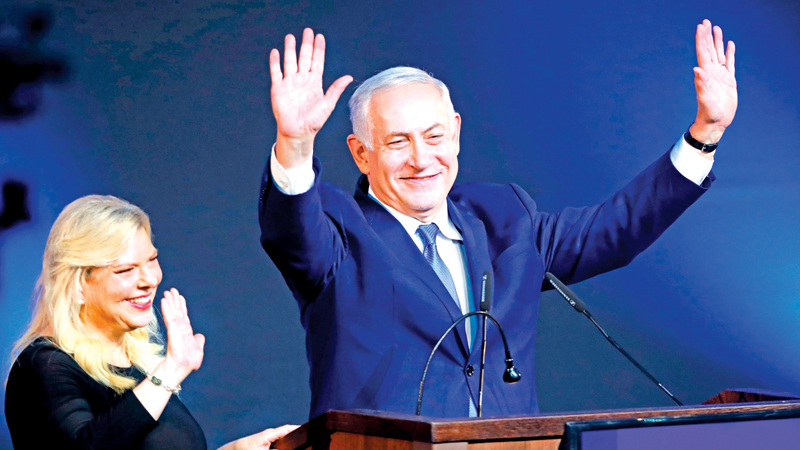 On Tuesday, he continually warned the Likud was at risk of losing as a result of what he said was low turnout among supporters, claims widely seen as a bid to motivate right-wing voters. Turnout was 67.9 percent compared to 71.8 percent in the last election in 2015. Gantz, a 59-year-old former paratrooper, invoked the corruption allegations against the premier to make his case that it is time for him to go. Netanyahu has been premier for a total of more than 13 years.